Above is the screen shot of where things were left at the end of the previous post. We had just added a new table and used the designer to create four columns, along with their data types. 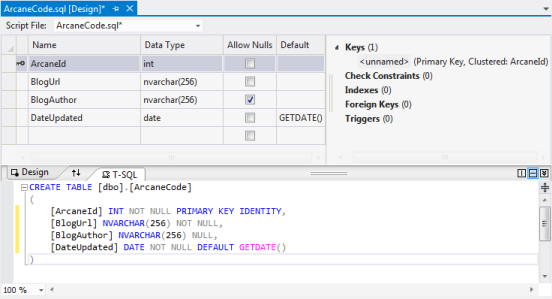 We also saw how we can edit the table in T-SQL and see updates in the designer’s grid above. But what’s all that stuff to the right of the grid? It would seem to list the various objects that would be associated with a table. In this case there’s only one, the unnamed Primary Key. But through this are we can also add new objects. Let’s add a simple index. Right click on the Indexes (0) area. from the menu pick Add New, then for this example we’ll pick a standard Index. When you do, a new index name appears below the Indexes (0) area, with a default name. Since this is going to be for the BlogUrl, I’m going to change the name to IX_ArcaneCode_BlogUrl. You’ll see the Indexes collection area has updated to reflect the new name, and the number in parenthesis has been updated to (1), to reflect the number of Indexes. 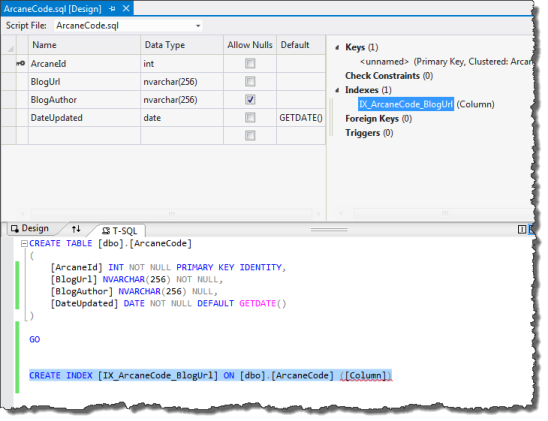 In the T-SQL area at the bottom, you’ll see some new T-SQL setup and ready for you to update. Here, all you have to do is change the [Column] to be the actual field name you wish to use in the index. In this case, [BlogUrl]. Think of the new designer as a combination of easy to use UI with a code generator. Creating other objects works just like you’ve seen here. You right click, pick what you want to add, and Visual Studio SSDT inserts the code template read for you to update.